Each morning, the students start the day with their clip on green. If they break a classroom rule, their clip will move to yellow. If they break another classroom rule, their clip will move to orange. If they break a third classroom rule, they will move to red and need to take a five minute break. Also, a note will go home stating the student was on red, as well as the reason why they moved up on the color chart. 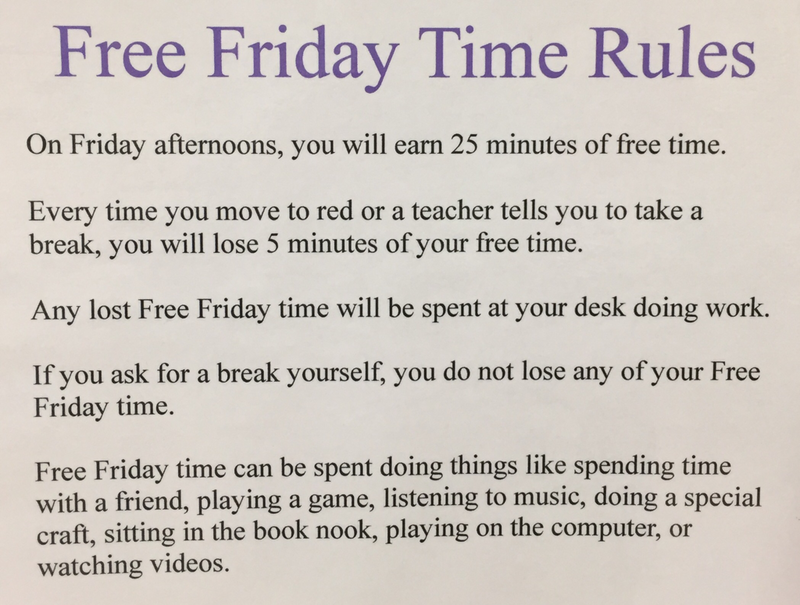 After the student has taken a break, they will lose five minutes off their "Friday free time", but their clip will return back to green. 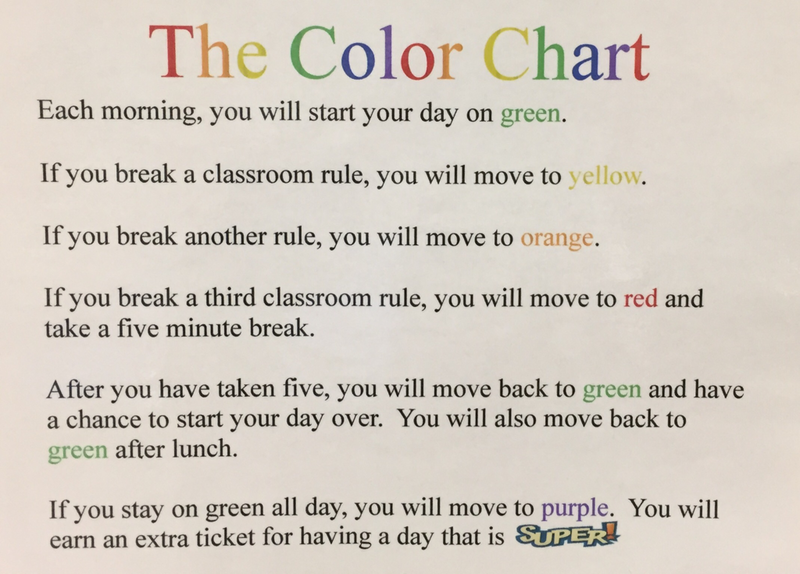 If a student stays on green all day, their clip will move to purple and their name will be written on an "I was caught doing a super job" ticket. Each time a student is caught doing something good, such as helping a friend, using polite words, etc., their name will be written on a ticket that says "I was caught doing a super job". 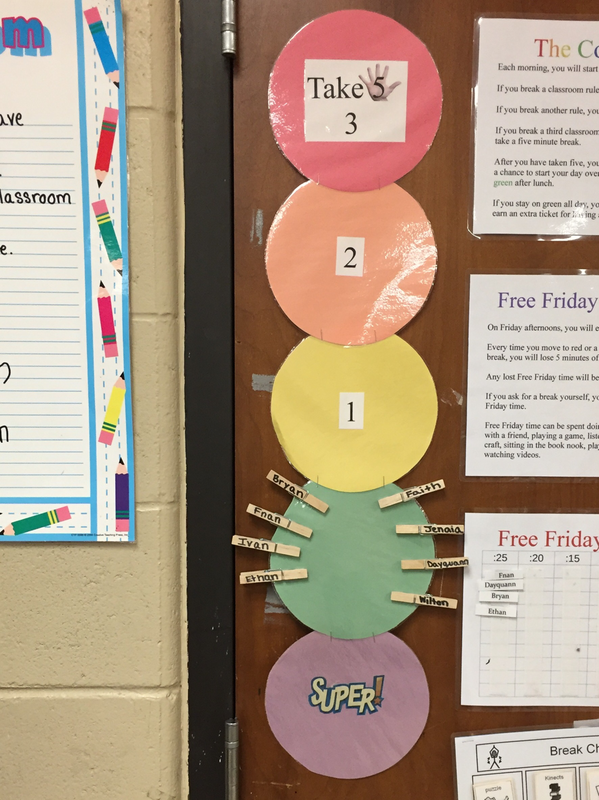 At the end of the day, a ticket will randomly be pulled from the "super tickets" jar and the ticket winner will get to choose from a list of free classroom rewards (i. e. sitting in the teacher's chair, playing a game, sitting in our book nook, etc.). On Fridays, the ticket winner gets to pick a prize from our class treasure chest. When the class earns a total of 75 tickets, they can cash them in for a class reward, such as a pizza party or a movie day.